This macro was created using a Reverse Lens ring fitted to my Canon 55-250 mm lens. 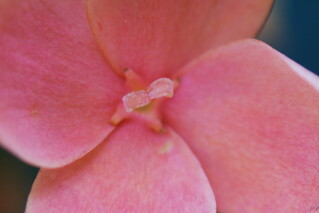 This is of one of the tiny flowers which make up the Ixora bloom. It is roughly half an inch across. There is feint blurring as there was a slight breeze blowing.